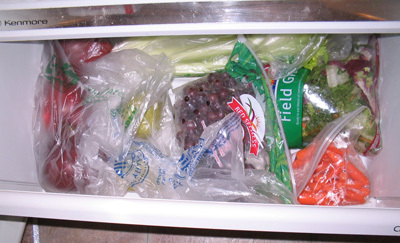 We are what we eat, so a look inside our refrigerators is like a full autopsy, without the icky blood to deal with. Unless you are one of my vampire readers. Didn’t mean to exclude you, nightstalkers! 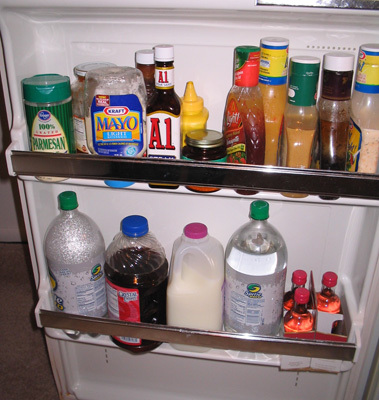 What can we learn by looking inside my fridge? First, I should buy stock in TupperWare, my container of choice for storing leftover vegetables and porkchops. Also, water is supposed to be tasteless, which it is not when it comes out of the tap, hence the Britta pitcher. I’ve got lots of diet sodas, yogurt, string cheese, eggs and a box of clementines on the top shelf. Until this month I thought a Clementine was just the daughter of a miner, a forty-niner, but it turns out they’re miniature cousins to oranges and tangelos too. I don’t know if I’ll get through the whole box before they rot though, lost and gone forever, dreadful sorry, clementines! Another fave is the bowl of fat-free, sugar-free chocolate pudding which is quite yummy despite its lack of fat or sugar. I got my mad food scientist on and added a half teaspoon of mint extract to my latest batch which was simply divine. Mint chocolate pudding, yum. Note, don’t lick the measuring spoon after adding the mint extract. It’s the taste equivalent of looking directly at the sun. Though my breath has probably never been fresher. In the bottom drawer are all my fruits and vegetables. I just did a grocery run, so I’m stocked up on apples, pears, grapes, carrots, celery and the greatest produce advancement this century – bagged salad! I heard a rumor that people used to have to cut up their own lettuce for salads. We are truly living in the golden age of food preparation technology. It’s easier to be lazy today than it ever has been. On my fridge door are some more diet sodas and some Crystal Lite Peach Tea. Most Crystal Lite flavors taste like 1 part flavor and 10 parts water to me, but the peach tea is quite good. And I don’t even like teas! I picked up a 4 pack of wine last night because I’ve been stressed lately. I loved the little miniature bottles because I’m all about portion control. We’ve also got a variety of low-calorie salad dressings, and yeast for my weekly loaf of whole-wheat bread, prepared in a breadmaker. See golden age of food preparation technology. In the freezer we’ve got enough Lean Cuisines for three weeks worth of lunches. When Meijer has a sale, you’ve got to stock up! They were also running their buy 1, get 1 free, special on bagged chicken breasts, as you can see on the left. There’s also fat-free Cool Whip for my pudding and some frozen ground beef. My water bottle is just chilling out, with a layer of ice in the bottom waiting for me to fill it up for a run. 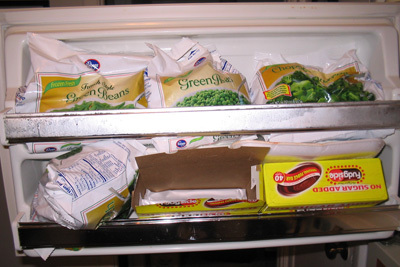 Finally, on the freezer door are bags of frozen veggies, waiting to experience the warmth of the microwave and then the acid bath that is my stomach. Plus some no-sugar added fudgsicles which again, are much tastier than anything without sugar in it has a right to be. That’s my fridge! Much different than it looked two years ago when it was full of non-diet sodas and the closest thing to a vegetable it ever housed was a jar of dill pickles. Hey Jennette! My first visit to your blog and I love it! Can’t wait to read all of the archives! Congratulations on all of your successess! And your Mother would be so proud of how clean your refrigerator is!! It’s very balanced. Plenty of variety. Nutritious. But, I can’t keep those fudgicles in my fridge. I know they are the best. I know they are sugar free and all that. But I can’t eat just one. And therefore, it’s purpose is lost in the translation. 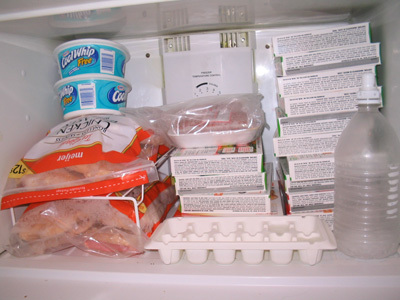 it’s crazy how much your fridge looks like mine. except i’m a diet coke girl. wow, it looks realy organized! mine is a bit different as I don’t drink soda, I keep the glad wear people in business, can’t get enough! Curious as to your receipe for pudding with the cool whip! Happy Holidays! Wow, much more organized and cleaner then mine, though maybe it’s because I have a 17 year old who loves to just THROW things in the fridge and freezer and close the door quick before anything falls out or before he can see if anything spilled. I have to admit to a secret pleasure of reading the refrigerator section in Rachael Ray’s magazine…and I loved looking at yours. It’s such a healthy fridge. Your commentary is so funny too! Was it you who was saying that you were taking some medication for migraines? I’ve read somewhere that aspartame can cause them (in women mostly), so maybe you could cut down on the medication if you cut down on the diet soda. You’ll need to look it up though, I’m not sure where I’ve read it. Oh, and don’t squish the clementineeees! I love’em! p.s. I’ve read in the recent comments of Fatty McBlog this: […] comments section here aor at BFB and don’t hold many of same beliefs as Paul, so to be honest, I rarely visit there. I actually stopped going there after an exchange he had with PastaQueen on her blog. Now I’m curious and I was wondering if you remembered roughly when that happened, so I don’t have to go through your whole archive. In exchange I offer you… uuummmm… hmmmm… my pseudonym in fattymcblog’s comments? Haha, yeah, that’s an incentive! I’m glad you can’t see inside our fridge. You’d probably find two packets of butter (for baking! not for me!) a lot of juice (also not for me! ), and about six broccoli stalks that are waiting to be turned into soup. And we have a freezer full of ice-cream cartons, most of which are actually full of soup, or bean stew, or Quorn bolognaise. You don’t really buy bagged salad, do you? Noooooo! Evil! OK, slight overreaction there. But on the few occasions I’ve bought it it only lasted a few days before it went soggy and disgusting – is there a way round that? I think I’m better at whole lettuce, which makes me feel better because it doesn’t come in unneccesary packaging. Where was I? Um, you seem to have a very healthy fridge. Monica–it’s in the comments section of “Acceptance, Not Complacency” (or something like that) on 7/25/2006. Ooooooooooooh…where did you get the idea to post pics of that??? Wow! Original and eyecatching!!! Samiam – For the mint chocolate pudding I made the chocolate Jell-O instant sugar-free fat-free pudding, mixing in 1/2 teaspoon of mint extract. It was very minty though, so next time I think I’ll just add 1/4 teaspoon. Then I put dollops of Cool Whip on top. Lori – Rachael Ray’s got a fridge section? Oh no, I thought I was being original! Monica – Yeah, I get tension headaches. I don’t know if I could give up the artificial sweetners though. It kind of weirds me out that people are talking about me on someone else’s blog. The entry being referred to is right here and got a lot of comments since it was semi-controversial. The back and forth with Paul wasn’t that dramatic, so if you were looking for gossipy !InternetDrama! you’re out of luck. K – If you open the bagged salad and then leave it in the bag, it will rot in a day or two. If you open it and then put it in a tupperware container with room for air to circulate it will last many days. It’s usually best to just use it all at once in a big salad to share with someone or eat over two or three days. PQ- love this post. Thanks. I need to clean out my fridge again. I don’t know if I could give up the artificial sweeteners though. so if you were looking for gossipy !InternetDrama! you’re out of luck. Awww… Oh, well, I’ll read it anyway. Wow, I didn’t even read the whole thing since I’ve kinda had my fill with the Fatty McBlog stuff, but that’s sad. Not just the Paul thing, but some of the other comments as well. I’m not going to re-start the argument months later, but, wow, sad. Bah. Wow pastaqueen, your fridge is so healthy and sane looking. Mine has nothing but condiments and take-out. I get steamed veggies and tofu and eat that instead of general tso’s, but it’s take-out still the same. You have inspired me to shop! The one thing I can’t drink is soda. It makes my tummy make weird noises. Vampire though I be, excuse me, fat-free, sugar-free chocolate pudding? What miracle is this? We have not such things in Cornwall. Is it a special brand or is it available all over the US? (About to book flight for first visit Over There, now planning to take extra suitcase). Silly me, I forgot this is the internet: have just googled Jell-O and found a UK supplier (CyberCandy, for anyone else in Britain who hasn’t quite woken up yet). 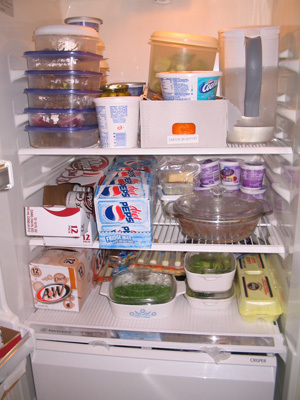 Your fridge is similar to mine with all the yogurt, veggies and yes, I have some diet coke or diet sprite, etc. But I have switched mainly to flavored water after reading the evils of pop. But it’s hard. Also, after many years of drinking it, it’s starting to bother my stomach (just diet pepsi/coke mainly). Maybe it’s finally worn through my stomach, ha! Thanks for visiting my blog the other day. Onederland is feeling great and hope to keep going down.